An area of frequent concern for photographers traveling is how to carry their equipment with them and not have it get wrecked by the ‘Ramp Apes’ (also known as the Airline Ramp Agents). I’ll admit, I go between bags depending on my needs or at times my mood, but some bags and cases are used regardless of my mood. My needs and mood were heavily affected this past summer when a suspected terrorist cell was stopped in the United Kingdom and a ban on cabin baggage went into affect for travel on flights departing the U.K. 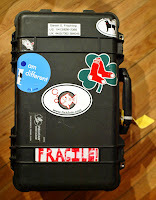 I was never a fan of rolling cases until I had three trips coming up to the U.K., or via the U.K., knowing my equipment would have to be checked…..No Ifs, Ands Or Buts about it. This caused me to shift gears and start exploring my options. ………. …….it turns out I had only one real option, the Pelican 1514. The Pelican 1514 is the same as the 1510, except it comes with interior dividers for storing equipment in a neat and orderly fashion. The set up is MUCH more convenient and easier to work with than the foam. Foam uses to much space and once you cut it you cannot reconfigure it. Being able to reconfigure a cases interior to meet your job-to-job needs is very important and often overlooked by many photographers. You kit will change, your lens selection may vary, your style of packing needs to be able to quickly adapt to your needs. My Pelican 1514 has now become a case I travel with often. Many of my flights involve small Regional Jets or Turbo Props (considering my “home airport” is only serviced by Turbo Props) and while my gear has never damaged (knock on wood) being dropped at the stairs to be picked up again at the stairs upon landing (this is often referred to as “valet checking” your bags) in the Think Tank Airport Addicted, I feel safer with the Pelican 1514. The Pelican 1514 conforms to carry-on bag standards for U.S./Canadian travel, although it may not fit the template for certain European, Middle Eastern and Asia-Pacific carriers. I have used the 1514 on flights from the U.K. to the U.S. with no problem, but that is not a certainty for EU to US flights. 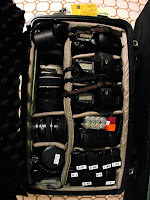 I have little fear of checking my equipment with the Pelican Case, after all the whole reason I bought it was because I knew I’d have to check my equipment on the way from from UK to US flights during the cabin baggage restrictions. My Pelican 1514 has probably only logged about 60,000 miles in 2006, because it was only purchased in the summer and it is not used on all my journeys, but does it’s job great! I do wish the wheels were a little bit larger and softer for use when not on perfect sidewalks, airport corridors or hotel lobbies, but the case is guaranteed for life. If the wheels break, I’ll just ship it back for new wheels. The case can look small to some people, but it can hold a lot. Once I add the “Lid Organizer” at some point the case will have even more cargo space, but for now, I use it the way it came from the factory. I like the foam up on the lid for some extra cushion, and I often stick some items behind the foam, such as small Speed-Rings, papers, extra batteries, cords, etc. I have three different “standard” configurations for the Pelican 1514, but I’ll list my two common configurations below. The photos at the end of this post are of the two following configurations. *I normally lay a small Domke pouch over the 70-200f2.8 with a small 3 outlet surge bar, a Canon 1D battery charger, an Energizer AA battery charger and a Canon 15f2.8L. Under the foam in the top lid I tape three TSA approved locks for the case and a 3ft zip wire that is lockable to secure my Pelican case. Obviously what the case hauls is modified to my needs for each job, but the above lists are the two most common configurations for me when I travel with the case. Some people want a bigger case, and I understand this, but a bigger case is larger than the maximum carry-on size which means your case will always be checked. While I am OK checking my lighting equipment, I am not OK checking my camera equipment (unless no baggage is allowed on board). Some thing you need to know about the Pelican 1514, when loaded the handle can really hurt your hand. I have two padded wraps on my handle,which are taped into place. I use two wraps, you can get them at stores ranging from Brookstone to Target, because the shape of the pull handle is awkward and it digs into my hand. With the two wraps it is OK. The pull-up handle to roll the case is very flexible, you may see it bend and think it is going to snap, but it isn’t. I stick a briefcase (The North Face Off Site : www.thenorthface.com/opencms/opencms/tnf/gear.jsp?site=NA&model=AE6C ) on the handle and while it ads to the weight it can handle it. When you are having the security check your case you should always offer to snap the latches shut. I have had two TSA Agents pinch their fingers in the latches shutting it after an inspection. One was pinched so hard he was bleeding through his gloves. I now warn everyone and they just let me shut my own case. hi there… i use a 1514 in my car; great to carry all i need and easy to secure. the problem i would have flying with one is if it got weighed. the last time i flew with camera gear carry-on, i had it in a tiny lowepro backpack.. the smallest one. it was still weighed three times (at each connecting airport), and i had to argue three times to let it on. since then i’ve got a LOT more gear, so my 1514 would pop the eyeballs of anyone who watched it go onto a weighing scale. has your carry-on (be it peli, mountainsmith or whatever) really never been weighed ? i agree with your theory of pretending your bag doesn’t weigh much, but watching at a checkin desk the other day i noticed that no one carries bags anywhere close to the maximum size allowed.. i’m amazed that when you roll up with the tank-like peli case you don’t have problems. Where specifically have you been flying from that you have encountered your case being weighed? I have never had anyone glance at it twice in the United States or Canada. I have also hauled my Pelican 1514 through Paris’ Charles de Gaulle (CDG), London’s Heathrow (LHR) and Gatwick (LGW) airports more than once, in addition to international departures from Toronto (YYZ), New York (JFK), Philadelphia (PHL), Charlotte (CLT) and Washington Dulles (IAD), never a problem. If you are leaving from London’s Standstead (STN) or Luton (LTN) or Germany’s Frankfurt (FRA) or Munich (MUC) as well as some other European or Middle Eastern departure points you may be considerably more likely to get your case weighed. I have only been stopped three times for a carry on weight check, ever. All three times were at Dallas-Ft Worth (DFW) , all checks were by American Airlines in early 2005. All were during connections through DFW and were done at the boarding door entrance. All were related to my Think Tank Airport Addicted Backpack. I am sure I will get weighed again some day, but I dream of world with airlines that follow BMI Baby’s (WW) weight restrictions for carry on……….there are none as long as you can lift the bag unassisted over your head to place it in the overhead bin! I have had my bags weighed in Oklahoma City, Lihu’e (Kauai), San Fransisco, Sacramento, Vancouver, and Dallas/Fort Worth. In fact, I had to remove a Robert Farber book from the lid of my 1514 in San Fransisco to make weight. Weighing luggage seems like SOP in my recent experience. Also, the book in the lid trick resulted in a hand search another time, as the x-ray did not see adequately through the book to examine the equipment below. Interesting. I have only had my bags weighed three times for carry on in the US. Only three times, ever. All three were by American Airlines at Dallas-Ft Worth (DFW). Are you checking your 1514 or flying with it as carry on? My Pelican 1514, loaded, has flown as carry on from SFO I dozens of times, I can’t even count the number of exSFO flights the case has been on. Most flights were on United or US Airways, however it has also flown exSFO on Delta, Alaska, Continental and Air Canada. Never been weight for carry one once. Same goes for United and Air Canada flights departing Vancouver (YVR) and United and US Airways flights from Sacramento (SMF)……….never been weighed not once. I have news for you, flying with camera gear with extensive camera gear will get you a secondary screening search well over half-the-time. I often tell the screeners ahead of time what my case is loaded with so they can get someone to do the search while they are examining the case. Also, flying with batteries, the X-Rays generally will not see through Canon 1D or Nikon D2/D3 batteries. They’ll tell you all sorts of things that were blocking their view of the x-rays. A paper book is not one of them.